Obama Commutes Sentences Of 214 Inmates — Most In 1 Day Since 1900 : The Two-Way Most of them were serving sentences for nonviolent crimes. The White House says it's the most grants in a day since at least 1900. Obama has commuted far more sentences than other recent presidents. 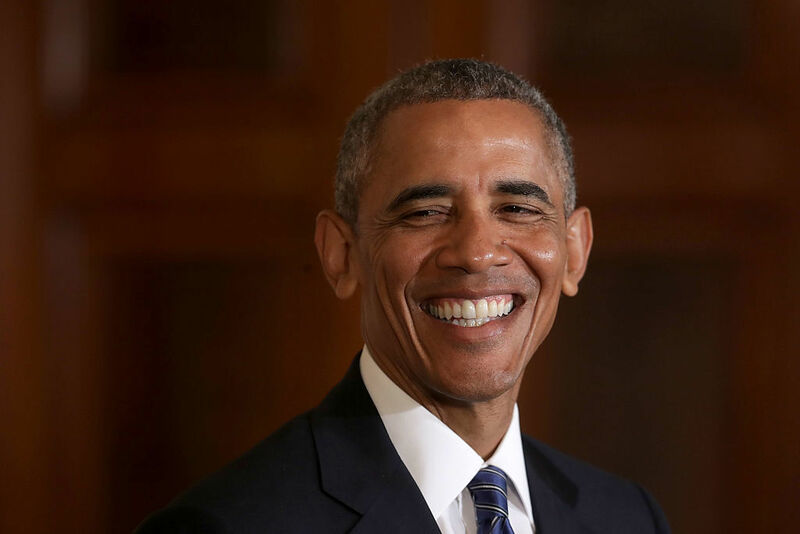 President Obama smiles during a joint news conference with Singapore's Prime Minister Lee Hsien Loong at the White House Tuesday in Washington, D.C.
President Obama has commuted the sentences of 214 federal inmates — "almost all" of whom were serving sentences for nonviolent crimes. According to the White House, it's the "most grants in a single day since at least 1900." That brings the total number of sentences that Obama has commuted to 562, vastly exceeding other recent presidents. "Since taking office, President Obama has fought for a smarter and more equitable criminal justice system," The White House said in a blog post. "He has committed to using all the tools at his disposal to remedy the unfairness at the heart of the system — including the presidential power to grant clemency." Those granted clemency today were "incarcerated under outdated and unduly harsh sentencing laws," according to a press release from the White House. They include 67 people serving life sentences. "For some, the President believes that the applicant's successful re-entry will be aided with additional drug treatment, and the President has conditioned those commutations on an applicant's seeking that treatment. For others, the President has commuted their sentences to a significantly reduced term so they are consistent with present-day sentencing policies." Obama has ratcheted up the pace of commutations during the final months of his time in office. But for some, it's still not fast enough. NPR's Carrie Johnson recently reported that dozens of law professors are warning Obama that time is running out. "I sometimes say that I feel like the guy that is rowing a lifeboat," law professor Mark Osler told Carrie. "And you're glad you have a few people in the boat, but you're feeling this impending sense of panic about the people in the water." Carrie reported that law professors pushing for more inmates to be freed say at least 1,500 prisoners should be freed based on the president's own guidelines. She explained: "Those guidelines apply to inmates who have spent at least 10 years behind bars for nonviolent drug crimes — small players, not kingpins — people who would've received less prison time if they were convicted of laws on the books today." A statement from the Justice Department called the move a step toward restoring "proportionality to unnecessarily long drug sentences." It added that the process isn't over, and "we expect that many more men and women will be given a second chance."